A photos of one of the newfound stellar exiles. 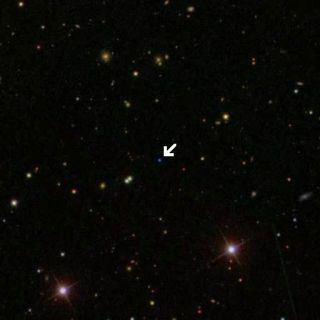 Astronomers last year spotted a star leaving the Milky Way Galaxy. Later one or two more were detected. And today, researchers announced the discovery of yet two more outbound stars. With so many outcasts on record, astronomers now see them as a new class of astronomical object, intergalactic stars exiled from their home galaxies. The two newfound exiles are racing out of the galaxy at more than a million miles an hour, fast enough that the galaxy's gravity will never reel them back in. "These stars literally are castaways," said Warren Brown of the Harvard-Smithsonian Center for Astrophysics. "They have been thrown out of their home galaxy and set adrift in an ocean of intergalactic space." Brown told SPACE.com that the same thing likely occurs in other galaxies, so intergalactic space is probably filled with wanderers. Brown's team found the first outcast last year. Two other intergalactic vagabonds were spotted by European astronomers; one of those may have come from another nearby galaxy called the Large Magellanic Cloud. There might be a thousand Milky Way exiles-to-be lurking inside the galaxy and on outbound tracks. The galaxy contains about 100 billion stars, so finding the outcasts is no easy task. Knowing what to look for is the key. To leave the galaxy, a star must somehow be accelerated outward. Here's what astronomers figure can happen: A two-star system, called a binary, rounds the center of the galaxy where it is tugged apart by the tremendous gravity of the central supermassive black hole. One of the stars is captured, while the other is shot outward as if from a slingshot. The scenario has been modeled on a computer. Finding the fast-moving stars is evidence that it actually happens. "Discovering these two new exiled stars was neither lucky nor random," said Margaret Geller of the Smithsonian Astrophysical Observatory, a co-author on a paper about the work that's been submitted to Astrophysical Journal Letters. "We made a targeted search for them. By understanding their origin, we knew where to find them." The researchers figure a star is flung from the galactic center every 100,000 years or so. Brown said other galaxies with massive black holes probably shoot stars out, too, and future observatories might spot them. The speeds of the stars were measured using the Doppler technique, in which light is analyzed for the same shifts that occur in the sound of an ambulance siren when it is moving toward or away from you. Because the actual physical movement of the stars was not observed, the speed estimates are minimums. The stars might be moving faster. In a couple of years , after enough time has passed to detect the proper motion of such faraway objects, their exact speed might be pinned down, Brown said in a telephone interview. One of the newfound exiles is moving in the direction of the constellation Ursa Major at about 1.25 million mph with respect to the galaxy. It is 240,000 light-years away. The other is headed toward the constellation Cancer, outbound at 1.43 million miles per hour and 180,000 light-years away. The main plane of the Milky Way Galaxy, where most of its stars reside, is about 100,000 light-years wide. Our solar system is in one of the outer spiral arms, roughly 26,000 light-years from the central black hole. Both of the newfound outcasts are outside the galaxy's main plane but have yet to leave the halo, a bigger sphere of the Milky Way's influence that is perhaps 300,000 light-years in diameter. But they will leave, Brown said. A light-year is the distance light travels in a year, about 6 trillion miles (10 trillion kilometers). The nearest star to our Sun is about 4.3 light-years away.